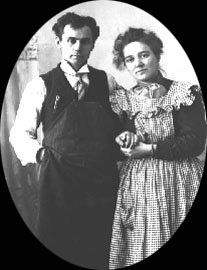 Darius and Tabitha Kinsey were a remarkable husband and wife photographic team whose partnership began in Whatcom County, Washington in 1896. With Darius taking photographs in the field and Tabitha developing prints in the darkroom, the partnership continued for 50 years, capturing images of Northwest landscapes, town life, portraits, and various industries. More than 4,700 negatives and 600 prints make up a valuable Northwest legacy. Kinsey’s photographs have been published in many historical reference books, used on the covers of novels, shown in the Museum of Modern Art in New York and exhibited in the company of some of America's greatest photographers such as Timothy O'Sullivan, William Henry Jackson and Eadweard Muybridge. Among his most popular prints are scenes from the logging industry. Other subjects include transportation: oxen, steam locomotives, train trestle construction, and architecture. Kinsey also took photos of Northwest natives. His natural scenes include mountains, glaciers, rivers, waterfalls, grasslands and prairies. But Kinsey not only covered the Northwest with his camera; he also photographed other noted locales including Yosemite, Yellowstone, the Garden of the Gods in Colorado and Golden Gate Park in San Francisco. He produced two Yellowstone printings, both from a visit to the park in 1904. The first is credited to Kinsey himself, while the second more common set credits his company, "Kinsey’s View Publishing House." Based on the numbering, it appears that Kinsey produced at least 100 different Yellowstone stereoviews. 584. Terrace Mountain, Golden Gate Canyon, Yellowstone Park, U.S.A. This view of the bridge at Golden Gate Canyon was part of the numbered series credited to Kinsey’s View Publishing House. This was probably the more common type of Yellowstone view by Kinsey. Untitled View at Norris Geyser Basin. 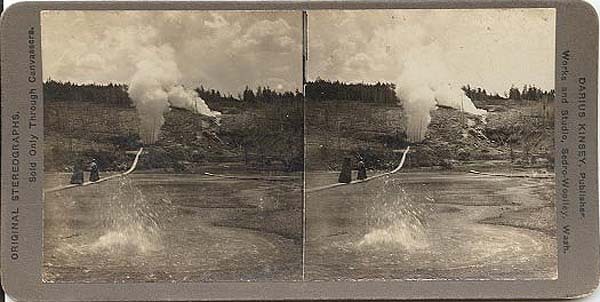 Kinsey’s rarer views were credited to his name only, such as this image of tourists on the planks at Norris Geyser Basin. These views are unnumbered and are quite scarce.